Large firms are, generally, better at implementation rather than innovation due to their long-established ways of doing business and other cultural elements. Their success is owing to optimization of existing business instead of due to ingenuity. 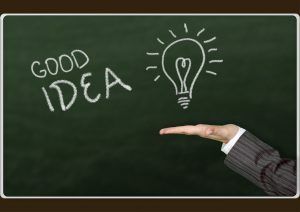 However, several large corporations are successfully innovating, by adopting certain unique attributes and approaches. In the corporate world, the CEO’s inspiring words are far from adequate to encourage innovation. It is the individuals’ aspirations that drive them to innovate. A realistic, long-term vision and strategic plan that triggers action is a facilitator to aspire. High level aspirations (vision) should be defined, made a part of the strategic plans, and linked with estimates of value (financial targets) that innovation should generate. These financial targets should be apportioned to all business stakeholders through performance targets. New ideas are priceless. Many organizations, however, get into trouble not from the scarcity of innovative insights but from irrational decisions in ascertaining the right ideas to nurture and scale. Identifying and scoping these potential opportunities involves insightful visioning of the future and meticulous strategic analyses. Companies should choose promising opportunities to explore concomitantly, carefully plan and execute the most viable options, and drop the ones deemed impractical. The insights discovery attribute is the essence of innovation. It is one of the chief concerns for the organizations to know how they can develop new ideas and insights. Analytical assessment of 3 crucial elements–a valuable problem to solve, the technology that enables a solution, and the business model that generates money from it—is of great help in generating valuable insights and ideas. Organizations need to consistently evolve their businesses before they are overthrown by technology driven startups. However, they are often reluctant to pursue Business Model Innovation (BMI) due to the various complexities involved—such as optimizing the value chain, expanding profit centers, or changing delivery models. Leading companies fight this trend by improving their market intelligence, establish separate budgets for new businesses, relentlessly assess their value chain, and deliberate on improved delivery mechanisms. They are always eager to test new offerings and operating models against environmental threats and competitors’ responses. Organizations often inhibit innovation from flourishing in their culture, unintentionally. Several factors discourage innovation, such as, restricted governance processes, stifling bureaucracies, slow approval process, and lack of teamwork. To accelerate innovation, it is important for organizations to investigate the validity of a promising idea by running it through end users early on during the development phase to gather valuable customer feedback. They also need to work on deploying empowered cross-functional project teams, curbing bureaucracies, outlining well-defined decision making processes. Robust scaling capabilities are critical to profitability. Organizations need to carefully deliberate on the extent and volume (i.e., market, regional or global) of an idea. This helps in ensuring allocation of appropriate skills and resources, organizing manufacturing and logistics facilities, and arranging suppliers for timely roll-out of the new offering at the desired magnitude. Innovators achieve significant return on their innovation investment by leveraging the skills and talents of external collaborators. Partnerships with external partners enables them to accelerate the pace of innovation, find novel value creation methods for customers and partners, gain new insights, share costs, and discover faster routes to market. 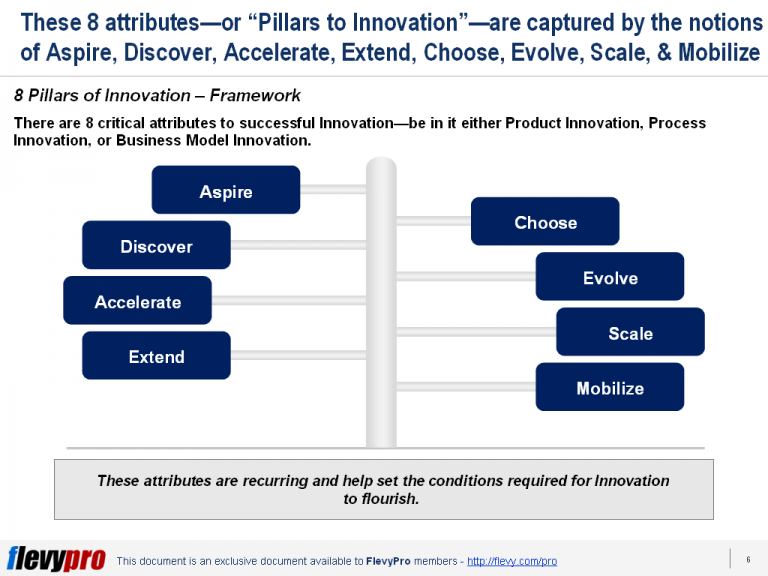 Interested in learning more about the Pillars of Innovation? You can learn more and download an editable PowerPoint on the 8 Pillars of Innovation here on the Flevy documents marketplace.